After the participation of Ion Astiazaran in the program "Juego deCartas" of ETB-2, now the owner of the Iruin de Zubieta cider house has started a new adventure collaborating in the "Gure Kasa" programthat is broadcast from Monday to Thursday at 9.30pm on ETB-1 guided by the Tellería brothers. With his extensive experience in the world of “sagardotegis”, the Astiazaran's collaboration consists on visits to different cider houses of all the territory. One of his last visits has been to the famous Petritegi cider house of Astigarraga. In the 16th century farmhouse the sixth generation of the Otaño family takes the reins of this cider house with a hundred years of history and whose name comes from "Pedro - Petri - Petritegi ", that is, the place or the house of Petri. Among the curiosities that Ion Astiazaran has discovered in this Cider House stands out the Urumea rivers denomination as the cider river. Years ago the cider was transported in boats to San Sebastian to its subsequent distribution through the city. If you want to continue learning more about cider houses of Gipuzkoa, do not miss the collaboration of Ion Astiazaran of Iruin Sagardotegia in "Gure Kasa". 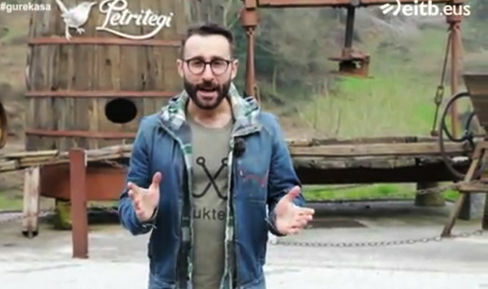 Ion Astiarazan visiting Petritegi cider house´s video.